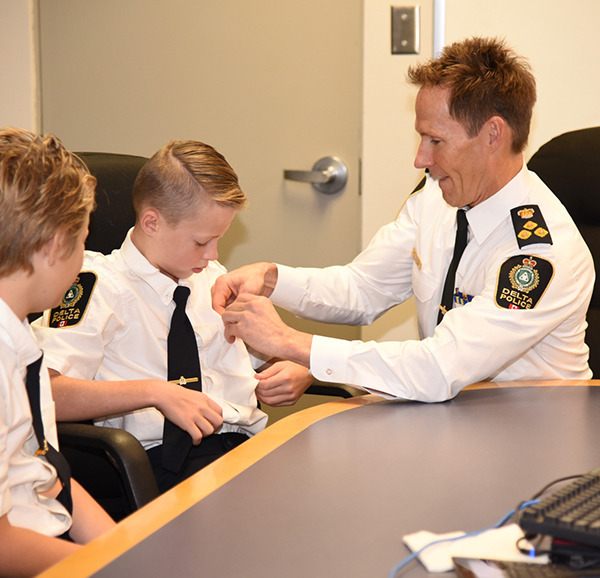 Two local elementary school students kept Delta Police on their toes earlier this week as the department’s “Chief Constables for a Day”. Evan Rusticus (left) and Morgan McDonough ensure everything is ship shape as Delta Police’s “Chief Constables for a Day” on Oct. 17. Evan Rusticus and Morgan McDonough’s day in the big chair started at 8:00 a.m. sharp on Oct. 17 as the pair were each fitted with a DPD uniform (of sorts) and then sworn-in by Chief Neil Dubord. The two attended the morning management meeting where they were briefed on all the goings on in the different sections within DPD, had a tour of the headquarters building and spent time with members of the department’s senior management discussing the ins and outs of running a policing organization. After lunch with Dubord, the two honorary chiefs were taken on a ride-along before spending some time learning officer safety tips and tactics from Const. Mike Atkinson, the DPD’s school liaison officer. Dubord said he had a great day with Rusticus and McDonough, adding the department is working with the Delta School District on running a special contest to select 2017’s Chief Constable for a Day. “It’s important for the Delta Police to connect with our young people. Their energy and enthusiasm allows for mutual learning. We learn as police how to better connect with our youth and what is important and they learn about policing in Delta,” Dubord said.